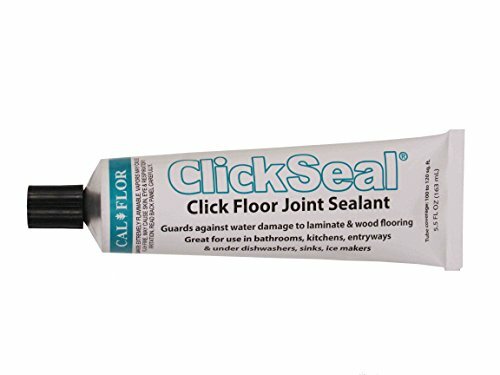 Cal-Flor’s ClickSeal 5.5oz click floor joint sealant is specially formulated for click locking systems to guard against water damage to laminate and wood flooring. ClickSeal seals and protects the joint, coats the seams, and penetrate the core of your flooring. The unique blend of wax and oil has been rigorously tested and proven that with proper use, ClickSeal leaves floors virtually waterproof. Great for use in bathrooms, kitchens, entryways and under dishwashers, sinks, ice makers, pet bowls and much more! Quick and easy installation: Apply a bead to the top of the tongue of plank and click flooring together. Easily applied and excess lifts right off with no residue. ClickSeal is a clear, sealant which greatly reduces flooring’s water absorption when properly applied. *Alternative locking systems such as fold-down, drop-in and those with plastic moving parts may require alternative application methods and users assume all risk. One 5.5 oz. tube will cover 100 to 120 square feet of flooring. If you have any questions about this product by Cal-Flor, contact us by completing and submitting the form below. If you are looking for a specif part number, please include it with your message.